Both charities assist Rugby players who have suffered serious injuries that have led to permanent disability. Try Tag Rugby is pleased to report that the 2014 event raised the most funds for these two fantastic charities than the previous two years. This tournament was also the biggest participation wise in its short three year existence. The day started with some sunshine but the 22 teams experienced some heavy Yorkshire rain on and off throughout the day at the Keighley RUFC. In the men’s division, there were 14 team entries but it was the Bradford & Bingley Bees RUFC that was victorious with a 6-2 triumph in the final over Leeds based, Lost Loiners. In the mixed division, the eight team field were mainly made up of northern based teams but it was a London based French team that stole the show by the name of Garlic Breed! Garlic Breed met the 5 Town Terriers who are based in Castleford in the final and it didn’t disappoint. In a nail biter, Garlic Breed got home with a 4-3 victory to claim their first one day tournament title! Despite the weather conditions, the tournament was deemed a success with everyone involved enjoying a day of Tag Rugby and having a great time. 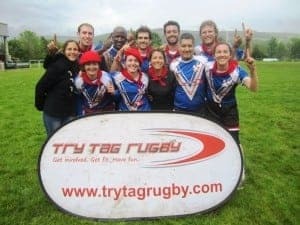 The team based in Wakefield, Wakefield CRL who lost the men’s plate final are already putting plans in place to challenge the London based men’s teams at the 2014 London Tag Rugby Championships on Saturday, 16th August at East London RFC in West Ham. With Try Tag Rugby launching in Yorkshire in 2015, the positive comments made by all the northern based teams is an encouraging sign that the northern expansion will be a success. Meanwhile, Try Tag Rugby’s biggest ever Early Summer season is currently at the halfway mark with 248 teams enjoying Tag Rugby across London & Reading. The Summer season (July – August) which kicks off on 24th June onward is now open for team and individual registrations. Registration for all the above tournaments is open and can be done via the Try Tag Rugby website. With the Tag Rugby communities’ elite players taking on Australia and Ireland in July, it’s going to be a cracking summer of Tag Rugby ahead! We hope you can be a part of it and we look forward to welcoming you to a Tag Rugby pitch soon. If you’re a Kiwi new to London, if you get involved you will make a heap of new friends, keep fit and have plenty of fun!